The fishing in the Great Smoky Mountains has been good to great this spring so far and will only get better. We were fishing to rising trout in the mountains by late February which has been about normal the last few years. An unusually warm February kicked off the early season hatches but soon gave way to a cool, wet March. Periodic bouts of high water has kept the streams running full. The first hatches of the year are normally Little Black Stoneflies, Early Brown Stoneflies, Blue Quills, and Quill Gordons. Little Black Caddis usually start early as well. Midge hatches are a daily occurrence and this time of year can even bring trout up to feed on the surface. On one early season guide trip, we started out fishing nymphs in the morning and caught several fine rainbow trout. By 11:00 am, fish were on the surface. With no discernible hatch, we had to put our faces down to the water before we saw the tiny midges. Being the lazy sort, I figured the fish would eat a Parachute Adams just as well. After catching a few fish on the Adams, we took a lunch break. While I was getting the food, Greg noticed a riser working. I convinced him to enjoy lunch first and give the hatch time to really get going. The lunch was not as leisurely as some, but we enjoyed relaxing a little before hitting the water again. By the time we finished, the big brown trout had rose several more times and we had dialed in its exact location. I cleaned up from lunch while Greg started working ever so slowly into position. A few casts later, he took a chunky brown trout that was well over the usual 5-10 inch size for a Smoky Mountain Trout. This 14″ fish would be the best we landed that day but not the best we cast to. We found lots of bugs in two more good pools which took us to about 4:00 pm. The sun was sinking behind the hills and the fish were slowing down. We tried a few more spots and even went back to fishing nymphs, but the burst of activity was done for the day. This is typical for the early season days. The possibility always exists for a late day spinner fall, but usually things slow down with the sinking sun. Do not overlook caddis. Some of our best fishing so far has involved caddis patterns. Stoneflies will be coming on now. Little Yellow Stoneflies have already been making a sporadic showing, but the best is still a few weeks out. Little Black Caddis have been much more reliable. We are almost done with this hatch now, but other caddis will continue hatching over the next couple of months. On one recent guide trip, we had a slow start to the day. Fish were not eating our nymphs. We finally switched to a two caddis pupa rig. One was a #14 with a tungsten bead while the other was a #18 that matched the hatching Little Black Caddis well. Within just a few casts, the indicator shot down. Everyone’s heart stopped when a gorgeous butterball brown rocketed out of the water. This fish jumped several times before moving to the classic brown trout bulldog position. Finally, the net slid under the fish. The little caddis pattern had done the trick. On this day, caddis pupa turned our morning around and gave us the confidence boost going into the afternoon dry fly session. 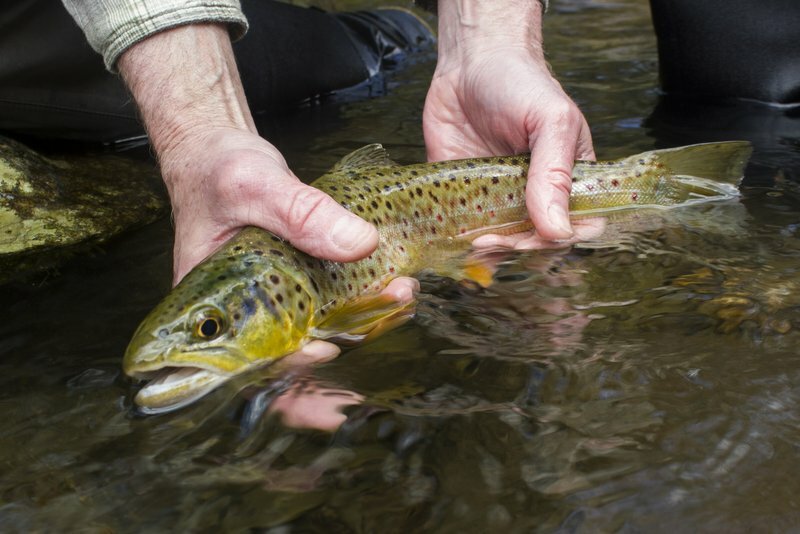 The months of April and May are probably the best all year for dry fly fishing. This year in particular will be very good. A wet spring looks to continue for the foreseeable future. The mayflies that start hatching in April will emerge best on those lousy weather days. Carry a rain jacket and be prepared to take advantage of those drizzly days. You won’t be sorry. It is even worth getting wet to experience this fishing once or twice a year. The Caney Fork is dropping into streamer shape now. Heavy rains are forecast for this week. If we get less than currently expected, the Caney could be fishable in the next week or two. If we get all the rain they are forecasting, it might be another month before we fish this beautiful tailwater. Thankfully, the excellent fishing in the Smokies should make up for this. April is just about full. We have a few more days available between myself and Travis, so if you are looking to get out in the Smokies to take advantage of this excellent spring dry fly fishing do not delay. May is also filling quickly, but we do still have some dates available. If you are interested in a guided fly fishing trip, contact me for more information or to book your day.